South Africa is a country with a wide range of diversity. Huge mountains erupt to reveal the windswept mountain range of Drakensburg stretching more than 1,000 km. The pristine white beaches which then unfold into two giant oceans and the elephants and rhinos that roam the numerous national parks that make South Africa so unique and great. 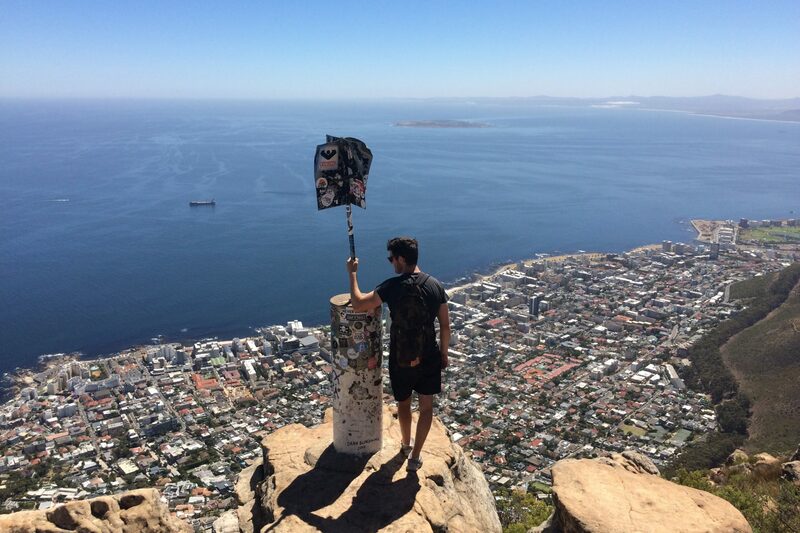 But South Africa’s jewel is its renowned wine lands that sweeps across South Africa’s Western Cape. With over 200 vineyards that blend in beautifully with the green rolling hills and the jagged mountains serving as a backdrop. South Africa is the eighth largest producer of wine, producing over 1,000 million litres annually. 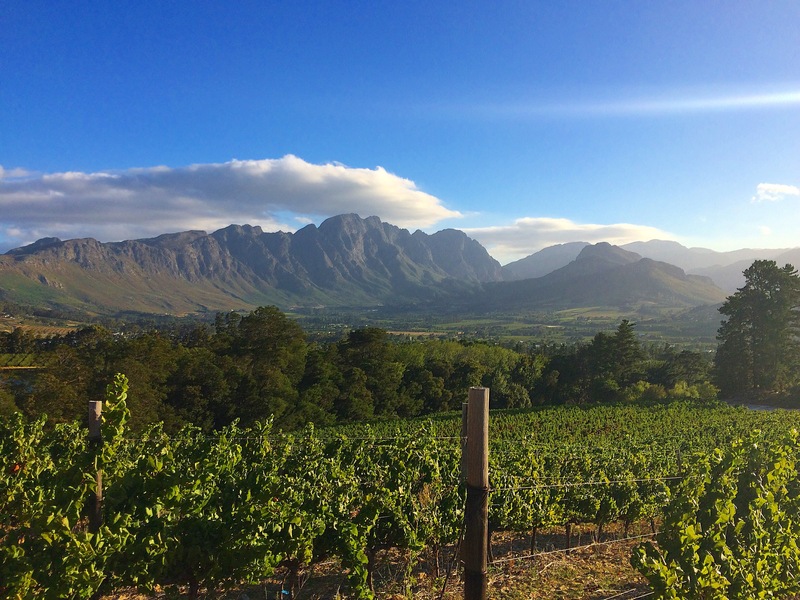 As we know vines thrive in the most stunning regions of the planet – Tuscany, California, Loire, Marlborough – and this couldn’t be more true of the South African winelands. Put the picturesque wine estates with some of the best wine available then this region is the prefect playground for any wine connoisseur. Only a 30 minute drive from Cape Town to Stellenbosch or Franschhoek which are the beginnings of the Cape winelands. Dating back to 1688, Franshhoek is a little bit of France nestled in South Africa and is known as the ‘wine and food capital” of South Africa. 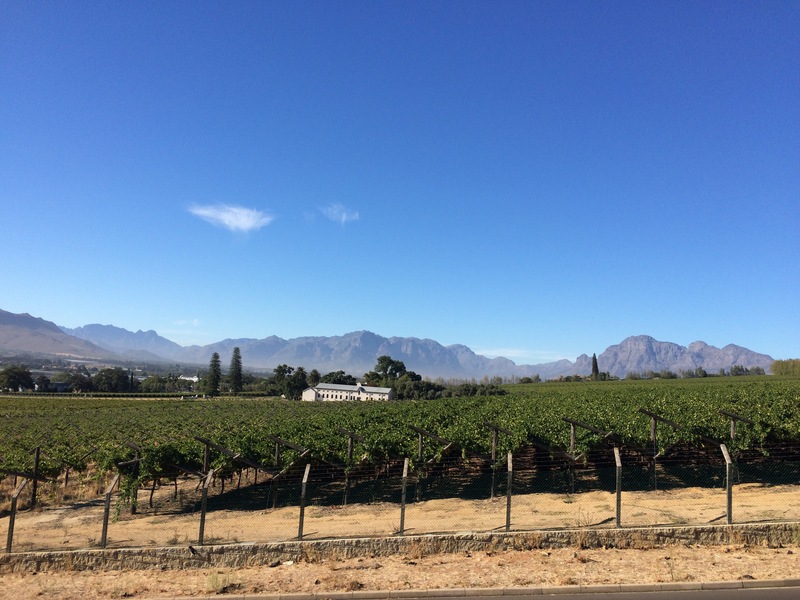 Franschhoek has a long history of posting some of the best vineyards in the world. With the strong wine culture and the pristine nature on show they both go hand in hand to make Franschhoek into a place of beauty. The wine tram which was once the branch line between Paarl and Franschhoek to serve the local farmers to get their produce to the local markets is now a service to tourist getting them from vineyard to vineyard across Franschhoek. You can take the wine tram tour which takes you to various different wine estates across Franschhoek. Most of the estates still remain in there original cape dutch farm houses which offer a traditional feel whilst wine tasting. Franschhoek offers some of the best vineyards for wine tasting. Grand Provence estate, Le Motte, Leopards Leap and Rickety Bridge all overshadowed by mountains looking down on Franschhoek. 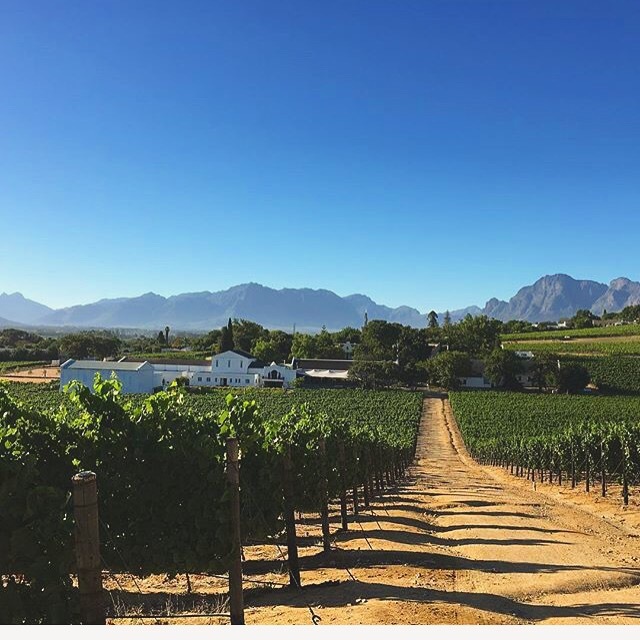 Stellenbosch is part of the Cape Winelands and boast some of the best wine estates in South Africa such as Spier, Delaire Gaff and Rust en Vrede which al have spectacular views across the vineyards and the surrounding mountains of Stellenbosch. Like most of the cape winelands, Stellenosch has a very historic architecture with many Dutch farm houses all over the town which adds to the towns character. just down the road from Stellenbosch is the Town of Paarl. There are a coupe of notable wineries in Paarl itself. The most notable of wine estates in Paarl are Spice Route, Nedurbug wines, Laborie and backsberg. 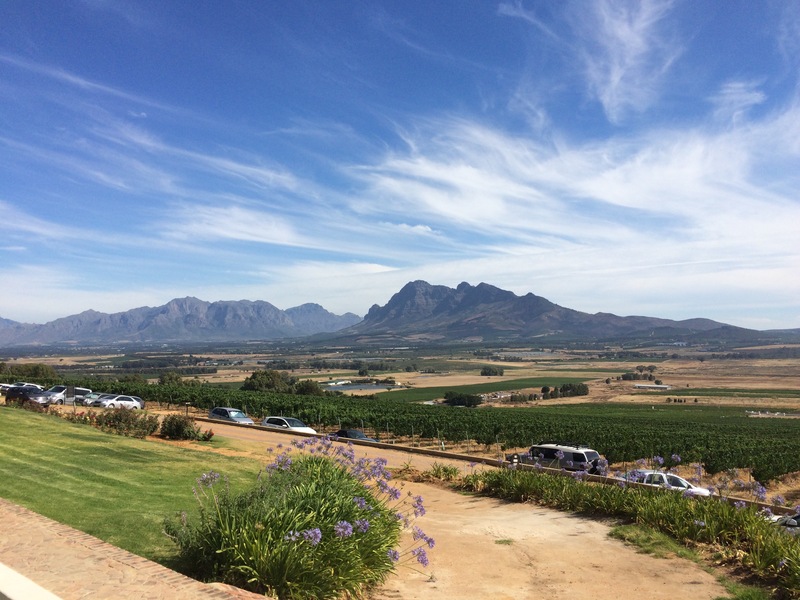 These vineyards have spectacle view of Paarl rock, The Du Toitskloof Mountains and if your lucky on a good day you can see Table Mountain from The Spice Route. If you are looking for a relaxing vineyard to chill and enjoy your wines in your own time and not be challenged to announce the aromas and flavours you’ve spotted then head to Fairview. located in Paarl, Fairview is a popular place, where charming staff will tell you as little or as much as you’d like to know about each of their classic wines. Also Famous for its cheeses and the perfect combinations of wine and cheese tasting is a fairview speciality. If you’re not the type to sit and relax and would rather be up and doing something then hit the bikes and ride through some of South Africas best vineyards. Another great way to see the vineyards is by horse back. Some Estates and company’s like http://www.capewinelandsriding.co.za offer great riding experiences.